Everything was going so great until we got to Round 3 then we have two of our guns go down after some big head knocks! There isn’t much we can do when this happens and no one can see it coming (despite what some punters will tell us). It is weeks like this when we are early in the season that we need to batten down the hatches and just bunker down and hope for the best. Oh, but while we are doing that we of course Scramble!! If I didn’t know better the AFL are trying to condition us to having a Thursday night game every week. I reckon they have been increasing the amount of these each season to the point where there will be one each week and we won’t notice that it has happened. Anyway, it gives us a chance to have a double crack at our captain in AF so let’s have a look and see what happened last night. Jake Lloyd – 122 Only just enough. Take it if you want to feel safe with points in the bank. Angus Brayshaw – 79 He copped a knock early in the last and struggled to find the footy after that. Max Gawn – 125 Yes this is enough. The big fella junked it up in the last 10 mins. He just stood in the square and took marks. Clayton Oliver – 108 Isn’t enough for us to take. The only ones you would consider would be Gawn or Lloyd but you may have someone that could go bigger than both. However, Points in the bank is always safe. Oh, and if you happened to put the VC on the top scorer on the ground, Harry Cunningham with 128 well done and I don’t believe you! As always we are looking at a line of 120 and if you have one of those guys that did score over that then you can take it. Just a quick one for those that like to calculate what they missed if their original C choice outdoes their VC that they took. If your VC gets 120 and you take that as your captain and your other option who you don’t take as a C (let’s say Danger) gets 130 you don’t lose 20 points you only miss out on 10. The reason for this is that you already have Danger in your side and you still get that 130. All you miss out on is the difference once, so in this example 10. Have I confused you all? Well good because I think I confused myself!! Thankfully we don’t have to wait to see if Fyfe is a late out as he has been ruled out already this week. That is a big plus for us as Fantasy coaches as we don’t have to plan for the late change. If you are playing Real Dreamteam or Supercoach then the equation is simple. You hold him. He will only be out for the one week and based on that you can’t waste one of those all important trades on a one week injury like this one. In AF when we have our two trades per week it is a much different proposition. This is all going to depend on what other issues or concerns you have with your side and what bench cover that you have. If you have an issue like a Dusty in your side then that is your first issue. We know that Dusty is only out for one with suspension but he is also in poor form at the moment so he is a better choice to trade out this week. Now normally we would look at fixing up rookies first however, swapping a rookie isn’t going to get you the points that you are missing from Fyfe. If you are playing just 5 or 6 Premiums (or premium scorers) on field then you may want to trade him out as you will be putting a 120+ scorer on the bench for someone that is going to get you a 60 at best. However, if you have 7 premium scorers on field and a good option on the bench that is able to score 80-90 like a Walsh to bring on then you can possibly risk just putting Fyfe on the bench. I guess you have worked out by now that I am not completely against trading Fyfe out in AF this week. This is partly why we have the two trades per week, just for situations like this. You can trade him out and then possibly bring him back in again either next week or the week after. This means that you can bring in a premium that will hopefully replace Fyfe’s scoring. I would be making sure that I pick a guy that is going to smash his BE. If you get a guy that has a really big BE then there is the risk they go down in value and you miss out on being able to get Fyfe back. Why not you say, there is no risk you say? Well yes there is a risk. One of the reasons we don’t like trading out a premium for a one week injury is that it is often very hard to get them back in again. We just don’t know what is going to happen in the future and what injuries or other issues you might face that are more urgent and before you know it Fyfe could be out of reach. Also if your trade results in a bucket of cash left over, don’t go and spend it all if you want Fyfe back next week as it is hard to generate any cash at this time of the year. So in conclusion just be very careful if you are going to trade him out. It can be done but just make sure you know the risks. At this stage Rocky has been named but just make sure that you have some coverage for him. There is always a risk that he could be a late out this week. And just be aware too that players that play the week after the concussion often don’t score well. So I wouldn’t be expecting any heroics from Rocky this week. Would I trade him out? No. He has been named so we have to assume at this stage that he will play. Now that we are a few weeks into the season we are expecting to see a bit more movement on the selections each week, but there wasn’t really a great deal of big moves. Here are a few thoughts on the fantasy relevant guys. 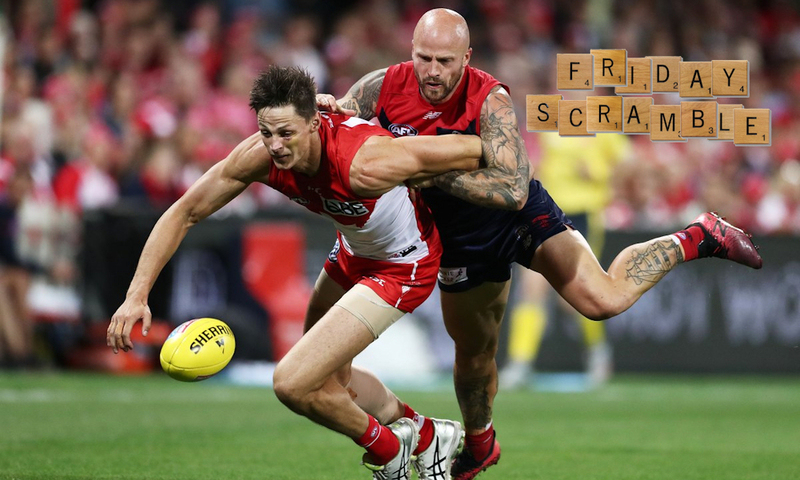 Levi Greenwood has been omitted and whilst he isn’t fantasy relevant himself, it is his tagging that is, and this means that Macrae should be left alone to run free. Bachar Houli is back for those that are relying on him in draft leagues. Bailey Scott is being rested! Not sure about this as these kids should be raring to go until at least the byes. Bryce Gibbs is the massive name this week who has been omitted! This is a big statement from the Crows and owners in both classic and draft wouldn’t be happy! Liam Stocker in for the Blues but he is only on an extended bench at this point. Michael Gibbons is also on that extended bench with Stocker and given his form he could be in danger of missing out this week. Don’t be too quick to trade in SC and RDT yet as there is a long way to go and not many trades to use! Don’t stress too much about what happened to Fyfe and Rocky, it is going to happen randomly to players and it is just luck of the draw. If you are doing the loophole just make sure you don’t select a player that could be a late in for your C.
Just temper your expectations for Rocky this week. Sorry I didn’t get to answer any questions this week, work and life got in the way a bit. I will bring back questions next week. Also I have been doing my best to jump on and answer some of your questions in the comments but I can’t get to all of them. As always there are plenty of people in the community that will help you out. Catch you all next week for Good Friday Eve footy! Need to a bit of help with my second grade guys. I’m leaning towards the first one however a bit nervous about trading out a guy averaging 110. Also need some cash I think for a Whitfield upgrade in near future. Who should i trade out, williams or smith? Playing the BE and cash grab game for 2nd trade and going Z Williams to Rozee. Figure ZW won’t make as much $$ as Setters, plus make money on the trade instead of lose. Positive this will bite me in the arse but YOLO. I mean $$ for this week only. Plus should be able to have a crack at Whits next week.